This recipe isn’t only for steak but you can use it for chicken or turkey as well. It’s getting close to football season and if you are having a party, knock people’s socks off with a twist on the usual marinade. Enjoy. 1. In a blender or food processor, combine the basil, scallions, thyme, mint, garlic, salt, lemon zest, and lemon juice. Pour olive oil over the mixture; blend until it turns to paste. 2. Using paper towels, pat the steak dry and place in a large bowl; slather the paste mixture all over the meat. Cover and refrigerate for at least 30 minutes or even better, overnight. If using chicken or turkey marinate no longer than 3 hours. 3. 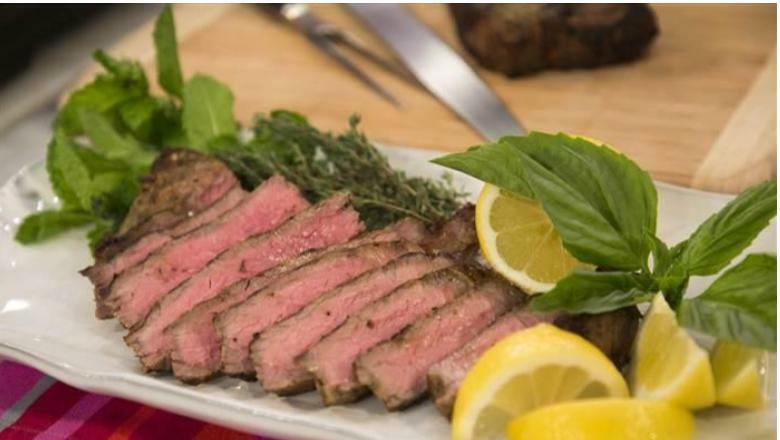 When you are ready to cook the steak, light the grill or preheat the broiler. Use a paper towel to pat the meat dry. Grill the meat over direct heat or broil until the meat nicely browned on both sides. Let it rest for 5 to 10 minutes before slicing against the grain and serving.